Discover the joys of canyoning. For people with some water confidence and reasonable fitness, with a big focus on fun. No experience necessary. Great for groups, teen-age families etc. Our most popular trip involving several abseils, lots of sliding, jumps big and small, zip-lines and a few other things besides. $250 per person. 9 am to 5 pm approx. *One of the most beautiful canyons we have seen. 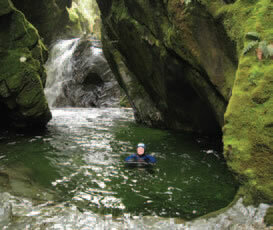 Emerald pools and incredible sculpted rock passages, all set in deepest rainforest. Probably our wettest trip, this canyon seems especially made for jumping! Sporty fun in the most fantastic setting imaginable. $270 per person. 9am to 4 pm approx.